Ivanka Trump looked more than ready for summer as she stepped out of her Washington D.C. home for a date night, but had to borrow her husband's jacket as the weather cooled. The president's daughter and her husband Jared Kushner were seen heading out to dinner a little after 6pm on Friday night. The 36-year-old White House adviser looked glamorous as she showed off her arms in a white Self Portrait asymmetric dress adorned with a black belt and a price tag of $495. A few hours later the couple was seen returning to their home on foot, smiling and looking lovingly at each other. It appears Ivanka underestimated the weather as she was pictured wearing Jared's jacket as the pair headed back to their home. 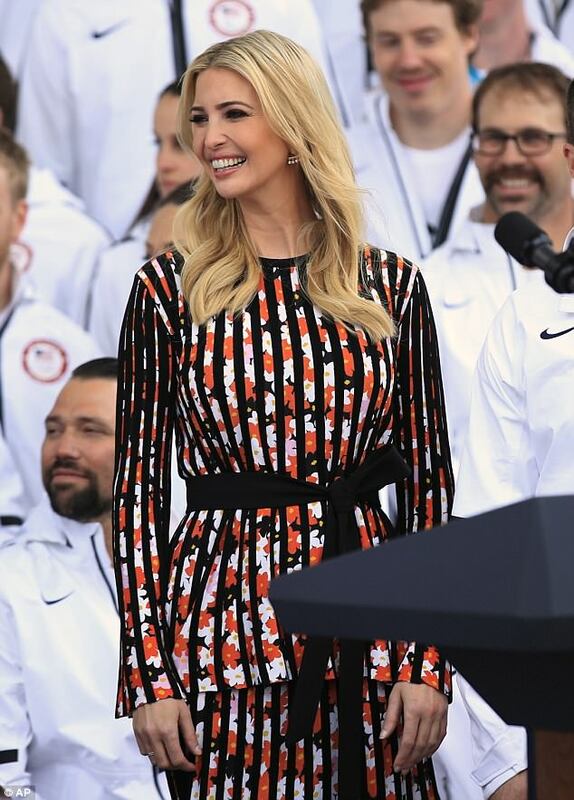 The first daughter's outing with her husband comes hours after she watched her dad pay tribute to the members of the U.S. Winter Olympic and Paralympic teams at the White House. The senior adviser, who led the U.S. delegation at the Winter Games closing ceremony in February. The president credited the Pyeongchang Winter Games with helping bring about this week's historic meeting between South Korea's Moon Jae-in and North Korea leader Kim Jong Un. Ivanka and Jared stepped out in Washington D.C., ib Friday, after a whirlwind week of events, including the first Trump state dinner for the Macrons. For that event, Ivanka chose a $12,888 Rodarte flocked gown. Today, she's a lot more toned-down choosing Self-Portrait's cold shoulder wrap-effect crepe dress. We love that Ivanka can switch seamlessly between designer to contemporary designers at more moderate prices. She loves Zara, too. The best part about watching the Ivanka fashion show is that often, we can get our hands on her choices. And, yes, Ivanka's Self-Portrait dress available at NET-A-PORTER and even on sale for $346.50. Click right to get yours now. Fortunately, there are plenty of cold-shoulder dresses out there so you have your choice. Check out some options from Jason Wu, Little White Lies and Proenza Schouler. We even included a pinstripe version of Ivanka's exact dress. See below. 'A lot of good things are happening right now over there,' Trump said. 'And the Olympics really helped to bring it all together." However, some of Team USA's most notable athletes were noticeably absent from the event hosted by President Trump. Invites were extended to about 200 Winter Olympians and Paralympians with roughly one-third of Team USA declining to participate in the festivities at nation's capital, according to AOL News. 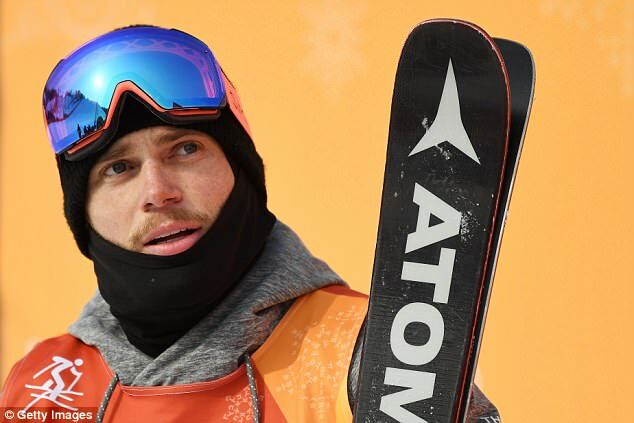 Alpine skier Lindsey Vonn, figure skater Adam Rippon, and freestyle skier Gus Kenworthy have all spoke out against the Trump administration and were among those who skipped out on the White House visit. Kenworthy, an openly gay Olympian, celebrated the number of athletes who opted not to attend the event on Friday. 'All US Olympians and Paralympians are invited to visit the White House and meet the President after the Games. Today is this year's visit and USOC spokesperson says he's never seen so many athletes turn down their invites. The resistance is real,' he tweeted. 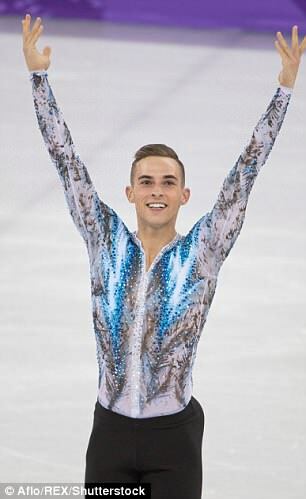 Rippon tweeted about his absence on Friday, writing: 'Olympians from the 2018 Games have been invited to go to the White House today. I will not be going. While Vonn, Rippon, and Kenworthy have made it clear that they are missing the event for political reasons, others had varying reasons for skipping the reception. 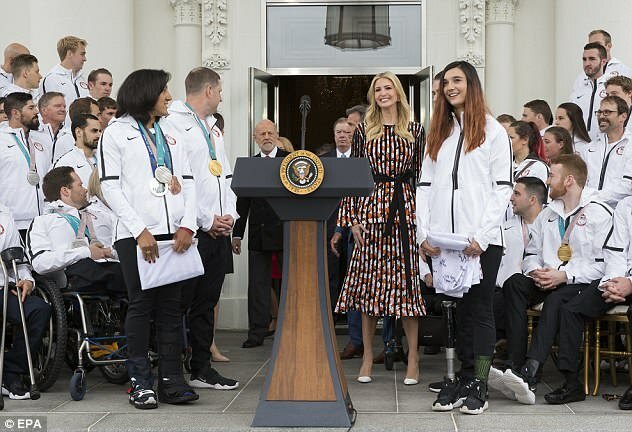 Ivanka also celebrated the athletes at the Team USA Awards at the Duke Ellington School of the Arts in Washington, D.C. on Thursday.